Few jobs have such a frenetic pace as that of a journalist. Day-to-day urgencies rarely leave room for reflection on our own work, to think carefully about the things we fail at, the things we do well in, and especially about what we can do to improve. That is why I appreciate my work as a professor at the UAM-El País School of Journalism, because it forces me to reflect on all this. It is also why I accepted, without giving it a second thought, the FIIAPP’s invitation to lead the International Workshop on journalistic reporting on the prevention of drug use and human trafficking, issues that are so important and so serious that they deserve even more care and self-criticism when dealing with them in the media. 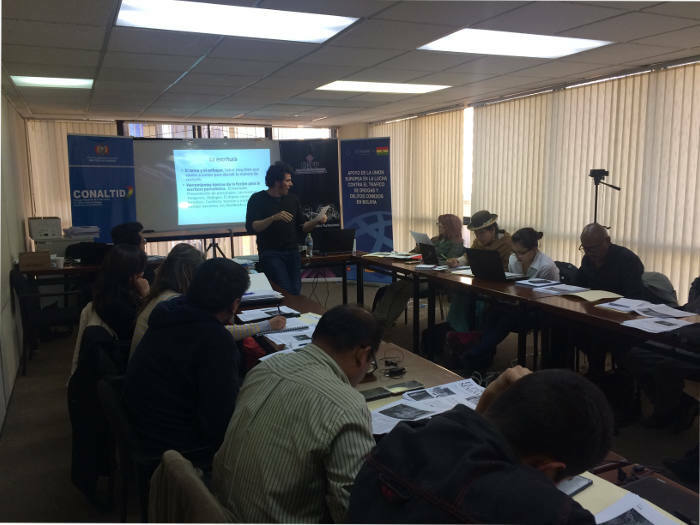 The workshop was held in La Paz, Bolivia, in coordination with the Coordination Secretariat of CONALTID and with the funding of the European Union and the AECID. In that context, the most logical thing for me to do was to propose, from the beginning, a joint five-day reflection with the participants, about twenty professionals from the Bolivian press, radio and television. Precisely, the diversity of the group (not only because they came from different media, but also because some were very young, newcomers to the trade, while others were seasoned journalists with decades of experience behind them) ended up contributing enormously to the workshop. But it was also the main difficulty, solved, in any case, by the chosen format: brief presentations accompanied by many examples of reference texts, a format which allowed us to immediately put into practice all the ideas and techniques presented, along with a lot of interaction and a lot of dialogue. This practical task consisted of writing a report about drug use or human trafficking. This enabled us to review the entire journalistic process, from the choice of topic, its development, documentation, field work, to the writing and editing (or in this case, proofreading). This way, we managed to delve deeper into fiction techniques that might enable us to present our work in a deeper and more attractive way, without ever losing sight of the strengths of any journalistic text: honesty, rigour, fact-checking each piece of information and giving the context needed to understand complex realities. That’s on top of striking the essential balance between professional distance and the sensitivity required when dealing with social issues in general, and drugs and human trafficking in particular. Many of the problems that the students faced are the same ones Spanish professionals face in our daily work: how to approach the characters, how to present the story and make it attractive, what part of the information, obtained with great effort, to leave out to improve the end result, etc. However, others had to do with traits unique to Bolivia, which has its own working conditions and cultural environment, for example the bureaucratic written procedure necessary to request almost any official information. The answers that we all gave to these problems, at the peak of their experience and mine, were the most interesting part of the course, at least for me, and I think it also has a lot to do with the philosophy of the work that FIIAPP does in all the countries it is present in. Apart from that, my objective for this course was to give the participants a series of tools to tell, in a slightly more attractive and familiar way, both the big stories, those large-scale events that the media relies on, as well as the small everyday stories, those that have to be covered at full speed, but which also deserve, apart from the essential rigour, all the care and affection we can give. Especially when dealing with sensitive issues such as those that have to do with drug use and human trafficking. The views and opinions expressed in this blog are the sole responsibility of its author.